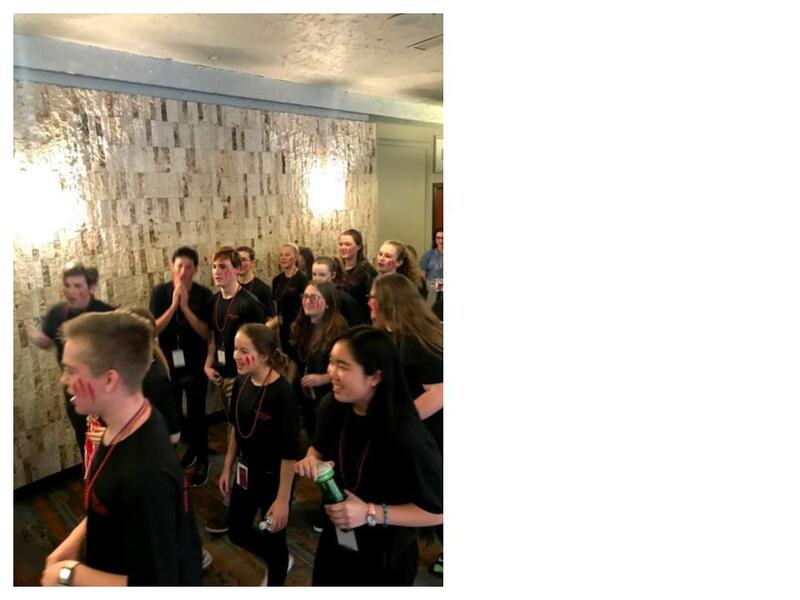 For the last seven years, I have had the privilege of chaperoning Indian Hill seventh through 12th graders at the Ohio Junior Classical League (OJCL) State Convention. In my 30 years as an educator, I have come to recognize and understand the importance that key events can have in shaping the learning of students and their development as citizens and as members of a community. The OJCL State Convention is one such event. Throughout this weekend, students engage purposefully and positively with one another as team players, leaders, scholars, artists, and performers. They must learn independence and how to work well as a group. They must manage their time and learn to be ‘in the moment.’ The weekend invariably weaves a tapestry of stories that more people should hear and that I am richer for having experienced. According to the OJCL website, “The Ohio Junior Classical League (OJCL) is the state organization which promotes the study of the Latin language and classical civilization. 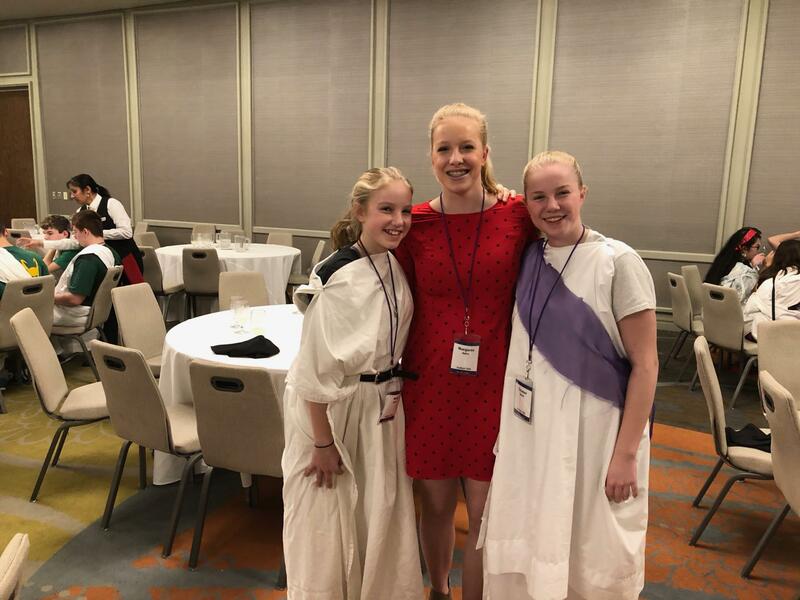 Each year, the OJCL hosts a convention in Columbus which brings together over 600 students, teachers, and parents from across the State of Ohio to celebrate the study of Latin. 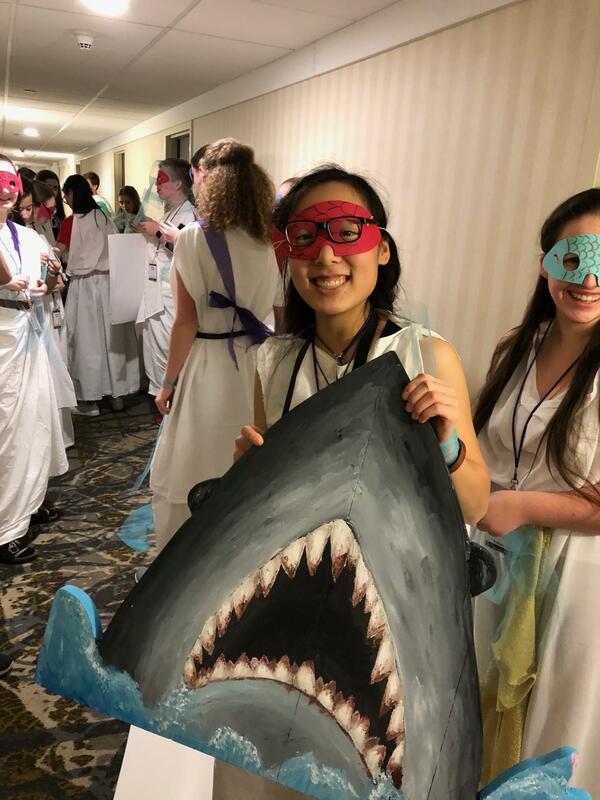 There are a variety of competitive activities at the convention: academic tests, art contests, certamen, and creative performances (in both English and Latin). In addition, the convention offers a number of social activities, including a dance, a toga banquet, and OJCL’s Got Talent! State Convention is also an opportunity for students to run for the OJCL Executive Board. 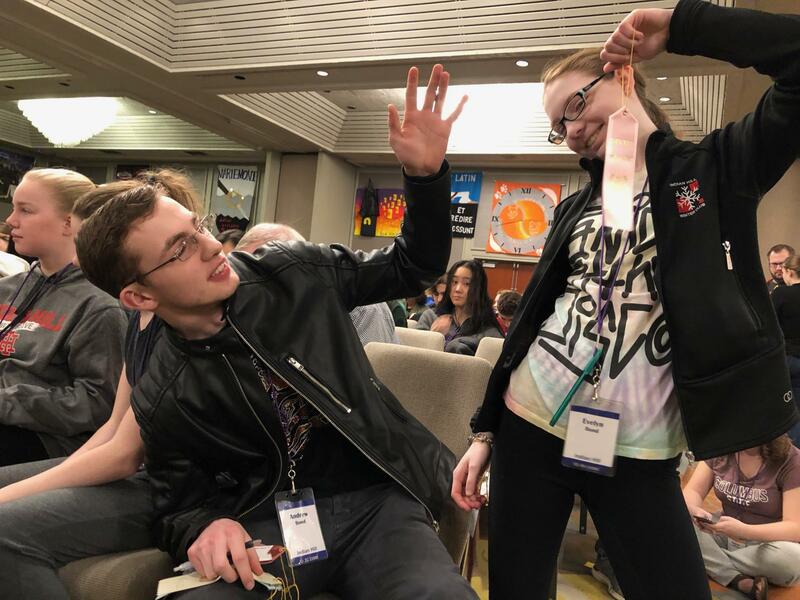 Delegations compete in various contests to win prizes and recognition.” These stories of student State Convention experiences are aligned with our District values, and clearly demonstrates Indian Hill High School’s pillars: leadership, integrity, pride, excellence, respect, and opportunity. Maggie Jutze, Indian Hill High School (IHHS) junior, ran as the state of emergency presidential candidate for the Ohio Junior Classical League State Elections. She made her campaign speech on stage in front of over 600 people. Jutze tends to prefer helping others rather than being in the spotlight, herself. “I had thought about running for office at State Convention in the past, but never went through with it,” Jutze shared. “I promised myself that if a position was in a state of emergency (one candidate running unopposed), I would enter the race. That office turned out to be president. Jutze said that running for OJCL helped her to connect with more students. Jutze ran a great campaign, spoke in front of the entire state delegation, and had many other students working to help her get her ideas across before the election. When the winner was announced, Jutze took it in stride. “Even though I didn’t win the election, I learned that running for office is something that I can accomplish. I plan to apply for OJCL State Gubernator, a role in charge of running Latin Club service and organizing events for Make a Difference Day. The gubernator has to coordinate events and communicate to club leaders and students. Indian Hill High School juniors Kim Zwolshen and Alison Ma talked about the important role of spirit as a part of the State Convention experience. Zwolshen is the co-president of the Indian Hill Latin Club. She and Alison worked with other student leaders to make sure that the Indian Hill students attending State Convention understood how to show their spirit at General Assembly events throughout the weekend. Zwolshen mentioned that showing spirit at a large event can be daunting. “It can be loud and chaotic when you enter a large room and there are 570 other people yelling at the top of their lungs. Helping our members with less confidence or experience to understand their role and to have fun is an important part of the Convention celebration and in being a team,” said Zwolshen. Zwolshen and Ma held discussions with other club leaders to build ideas on how to improve, develop strategy, and how to ensure new attendees understood what to do. There were props, cheers, and a lot of practice to make sure all club members were ready to show their spirit. “Leading spirit is a group effort,” said Ma. “We placed ourselves at either end of the group to encourage all to participate. Any veteran of convention should be helping to lead the cheers.” Ma reports that she had never yelled before she got to high school. “I’ve found I have a pterodactyl screech and surprising amount of stamina when it comes to cheering for our club,” she joked. Both students said that their role at OJCL State Convention had changed this year from participant to leader. Zwolshen has advice for how to be a better group member. 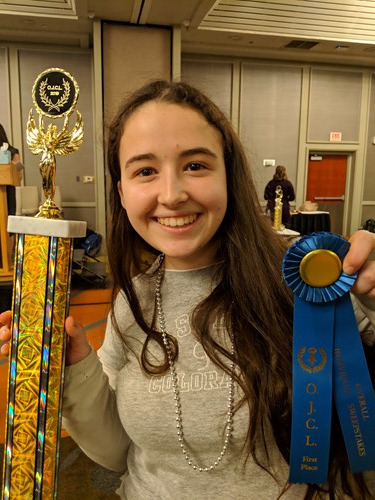 For the second year in a row, Indian Hill High School junior Olivia Sheldon won the Overall Sweepstakes Prize at the Ohio Junior Classical League State Convention. The Sweepstakes Prize is awarded to the student who won the most points across all contests: Graphic Arts, Creative Arts, Academic Tests, Certamen, and Pre-Convention. Sheldon reported that she entered a total of 23 arts-based contests this year ranging from poetry to costuming and a lot in between. “I only entered 17 projects last year in Graphic Arts,” said Sheldon. 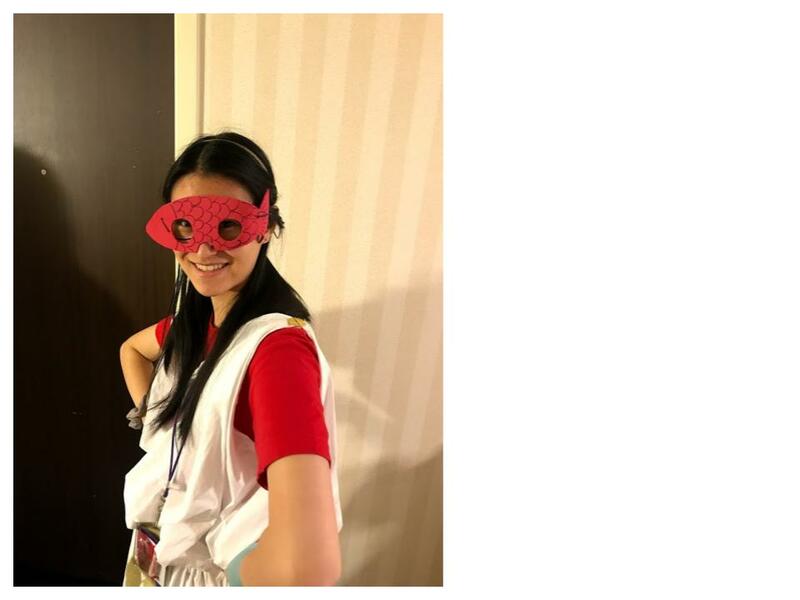 “During a trip to Rome over spring break with a group of Latin Club students I already started planning with other club members some projects for next year’s convention that can include our photos and videos on location. This year at convention, I also was more involved - we helped Maggie (Jutze) with her campaign and helped to lead other students through the schedule of the weekend’s events. Indian Hill High School junior Blake Phillips attended his first OJCL State Latin Convention this year. One of the elements of OJCL State Convention are the multiple opportunities for leadership, formal and informal. Phillips saw a chance to help our Indian Hill Latin Club and ran with it. He became the self-appointed campaign manager for Maggie Jutze’s bid for OJCL President. Phillips toured Italy with the Latin Club over spring break and said he definitely plans on going to State Convention again next year. 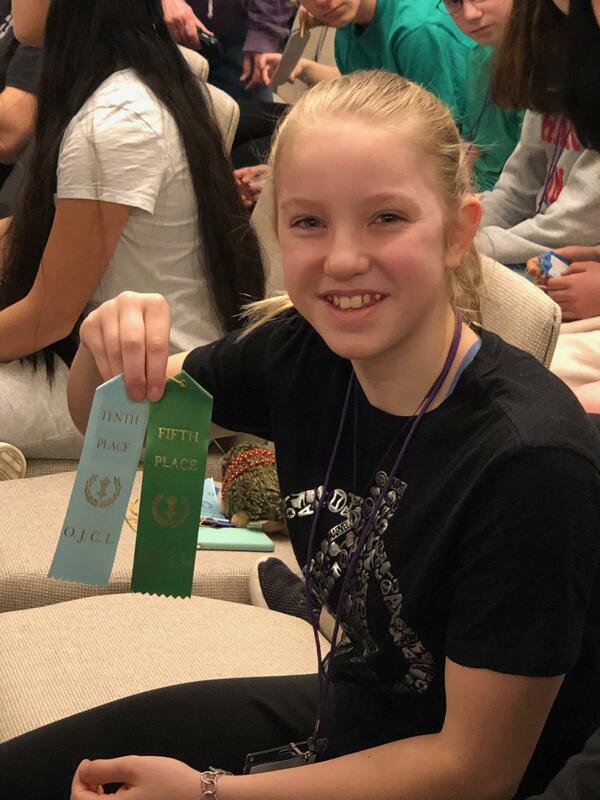 “My brother, Andrew, liked the convention last year and it sounded like fun so I decided I should go,” said Evelyn Bond, who attended her first Ohio Junior Classical League State Convention this year as a seventh grader. Bond said she enjoyed taking the academic tests. In fact, she earned first place in her division on two of the tests she took. As Bond would discover, academic achievement isn’t the only focus of State Convention. Molly Jutze attended her first OJCL State Convention as a seventh grader this year. When her eleventh-grade sister Maggie decided to run for OJCL State President, Molly agreed to introduce her sister on stage in front of over 600 people. “The convention was really fun and exciting, but standing up in front of a crowd of 600 people to introduce my sister for OJCL President was scary!” Molly reported. Even so, she shared that she felt like she had accomplished something important by speaking on her sister’s behalf. Molly plans to attend next year’s Convention and to double her project entries. 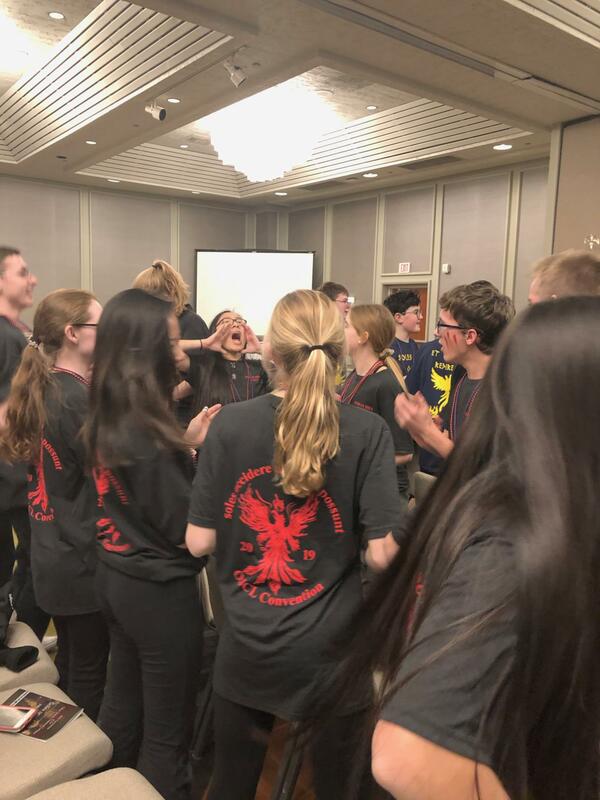 These were just a few of many stories created at the OJCL State Convention this year and just one of the many opportunities that Indian Hill Schools offers its students to grow both in and beyond academics. I feel fortunate to be able to share in these stories, to work with our students and families, and to be a part of a district that values the growth of the whole child.